A very nice DoK group from the next DNW auction. Robert Browning was born in Wandsworth, Surrey in 1871. He enlisted into the Kimberley Town Guard, being present during the siege of Kimberley when he served as Colour Sergeant. In March 1900 he joined the Kimberley Regiment as a Lieutenant and was promoted to Captain in July 1903, Quartermaster in September 1910 and Honorary Major in February 1911. He served with the Kimberley Regiment during the early months of the Great War, seeing service in German S.W. Africa. As a Major in the 7th Regiment (Kimberley Regiment) he entered France on 7 June 1916, later serving as a Major with the Royal Welsh Fusiliers. 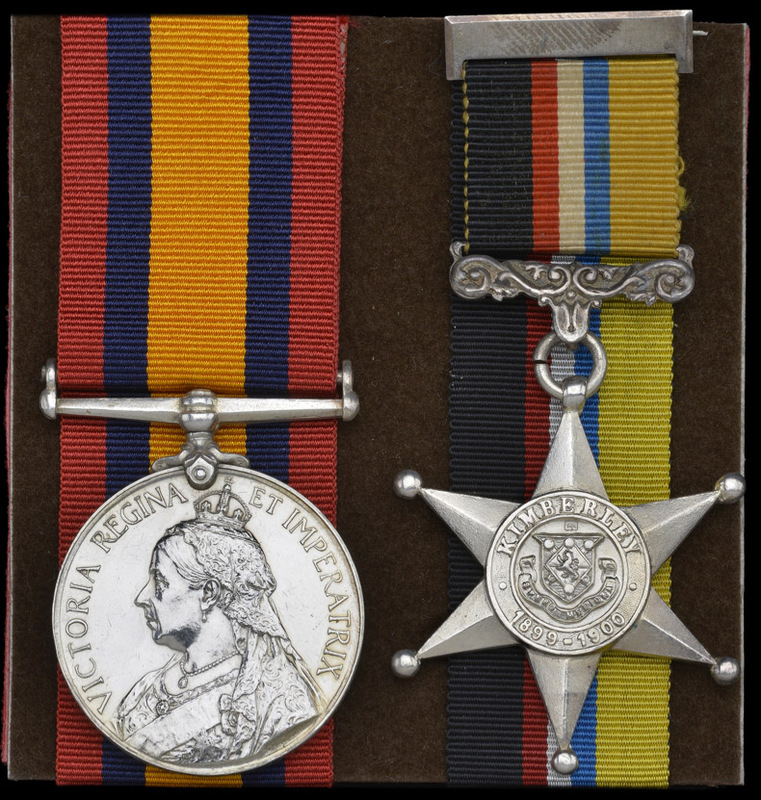 Awarded the 1914-15 Star by the South African authorities, he applied for his British War and Victory Medals in October 1923 giving his address as ‘52 Praed Street, Paddington, W.2’. Major Robert Browning died in the London Hospital, Whitechapel on 7 January 1932, leaving his estate to his widow, Catherine Elizabeth Sanderies Browning. Lot 145 is an intriguing item. DNW advertise it as QSA (1) DoK but as the picture shows there is no clasp. A no clasp medal was earned by Gilchrist, a 'signaller at alarm post' according to the roll. The medal, without the Star, was sold by Glendining in 1982 where it was noted as being a renamed medal. I think is always nice to see a medal with this particular clasp to a British soldier! Of course, in this particular case, he did not earn his clasp whilst actually serving in the British Army. djb wrote: A very nice DoK group from the next DNW auction. To be serving as a Colour Sergeant in the KTG would you expect that he had previous military experience? He was 28 when the Siege started. Yes indeed, but, he did not earn the clasp as a member of the British Army, notwithstanding, still a very nice group! Perhaps, I should add that at the time, service in the Colonial Corps did not always look good in the eyes of a surprisingly large number of old school British officers!